Workers are picketing as many as 40 stores around the country. Lloyds Pharmacy workers striking outside Lloyds head office in United Drug House, Magna Business Park, Citywest. EIGHT BRANCHES OF Lloyds Pharmacy are closed today and staff are picketing dozens more as they continue their dispute over low pay, zero hour contracts and the denial of trade union representation. In a statement issued earlier this week, Mandate Trade Union, which represents the staff on strike, said today’s strike – the eighth so far in this dispute – was “inevitable following the company’s continued refusal to engage with the workers’ designated representatives”. 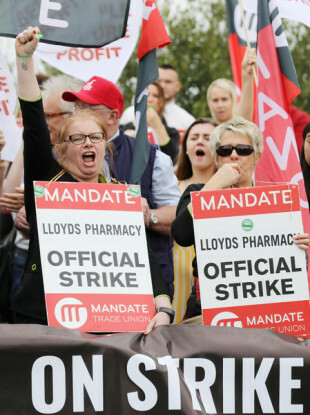 This morning, a spokesman for the trade union said that Lloyds has hired locum pharmacists to work during the strike and many of the stores will be forced to close early. Mandate recently claimed it received reports that Lloyds management “deliberately distorted a recent vote on the company’s proposals by allowing up to 70 workers in head office to vote on other workers’ conditions of employment that have no bearing on them”. “When you factor in that every person voting had to supply their name, clearly this would influence the vote. We are now calling on management in Lloyds Pharmacy to respond to these allegations immediately,” Mandate’s Assistant General Secretary Gerry Light said. A representative for Lloyds Pharmacy said that “the company did not administer the ballot, the staff representative did”. “The improved pay and conditions affect all staff, thus all staff were rightly facilitated to vote. Is Mandate suggesting excluding people from the process?” a spokesperson for Lloyds Pharmacy said. As previously reported by Fora, Lloyds Pharmacy and Mandate attended a Labour Court hearing at which the union sought various changes to pay, contracts and annual leave entitlements. One of the issues Mandate says workers were protesting against today is the so-called zero-hour contracts. A spokesperson for Lloyds pharmacy previously told TheJournal.ie that they’ve never had zero-hour contracts. Lloyd workers are planning their ninth strike day for Saturday 25 August. A full list of stores closed today can be found here. Email “8 stores closed today as Lloyds Pharmacy workers strike continues ”. Feedback on “8 stores closed today as Lloyds Pharmacy workers strike continues ”.